Each year the First Congregational Church of Woodstock church school children raise money for Heifer Project. Heifer Project began in 1944 as a project of the Church of the Brethren to alleviate hunger and poverty. Today it is an ecumenical, nonprofit organization with many member agencies. Diane and Lela lead Naomi from the Fairvue Farms trailer to cheer on school children raising money for Heifer International. Heifer International helps struggling families become self-sufficient, by supplying them with farm animals, training and technical help. Recipients agree to share know-how they have gained with others and to pass on the offspring of their livestock to others in their community, thus multiplying the gift. ONE heifer can deliver up to 4 gallons of milk every day. Income earned by selling surplus milk pays for tuition, medicine, clothing and better housing. Cows are a natural fertilizer factory to help crops grow. A healthy cow can have a calf every year. A gift like this can eventually help an entire community move from poverty to self-reliance. The children focus on a different animal each year. Over the years, they have learned about water buffalo, sheep, bees, goats, and ducks. 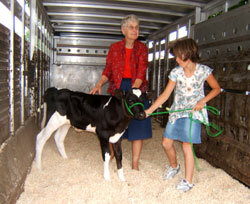 In 2008, they chose to learn about heifers (young female calves). They adopted “Naomi ” from Fairvue Farms as their heifer mascot. Lela and Ciri Miller, granddaughters of owners Paul and Diane Miller, selected Naomi because of the heart on her forehead. Naomi was born on July 31, 2007. Fairvue Farms transported Naomi to church in September 2007 to help kick off their Heifer fund raising project. Lela worked with Naomi for several weeks beforehand so Naomi would know how to behave in public!